Whether you've got a 14 ft. mini-toon or a whopping 28 ft. long tri-toon weighing up to 6,800 pounds, EZ Loader has you covered! 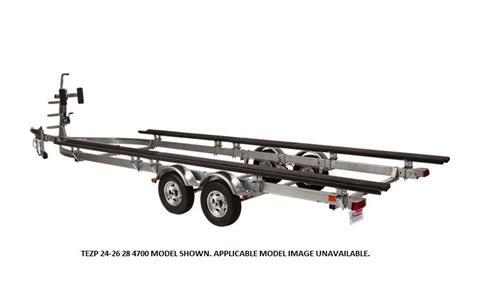 EZ Loader has 21 different adjustable pontoon trailers to choose from. Available in aluminum, galvanized or our new silver-black textured powder coat, with options and accessories to fit every need. EZ Loader is how the pontoon world gets to the water! Find a dealer near you. Available in Single, Tandem, or Triple Axle Galvanized or Powder Coat. Available in Single or Tandem Axle Aluminum. FOOTED TONGUE JACK – ADJUSTABLE: Heavy duty footed tongue jack provides a strong and sturdy solution for heavier trailer/tongue weight. DISC BRAKE SYSTEM – ADJUSTABLE: EZ Loader's disc brake’s calipers resist corrosion and add additional protection in tough saltwater conditions. HYDRAULIC DRUM BRAKES – ADJUSTABLE: EZ Loader’s hydraulic drum brakes are hot-dipped galvanized for additional protection against corrosive elements. SWING TONGUE – ADJUSTABLE: This new design allows for a perfect solution when your boat trailer is too long for its storage area. Available on many models. SPARE TIRE & CARRIER – ADJUSTABLE: Get the additional peace of mind when traveling with an O.E.M. Spare tire and Carrier. EZ Loader offers many styles to choose from. PVC LOAD GUIDES – ADJUSTABLE: Sturdy EZ Loader PVC load guides help direct your trailer during launching and guide your boat in. CHINE LOAD GUIDES – ADJUSTABLE: Unique low profile load guide system centers and protects boat during loading. Available on select models. FIXED BUNK EXCHANGE – ADJUSTABLE: For boats that require extra support on smaller EZ Loader boat trailers. Ask your dealer if your model applies. FIXED BUNK EXHANGE ON Y-FRAME – ADJUSTABLE: Extra boat support for y-frame boat railer models. Ask your dealer if your model applies. JONBOAT EXCHANGE – ADJUSTABLE: Cross bunk to give extra support for longer bunks & jonboats and other flat bottom boats. BUNK LOAD GUIDES – ADJUSTABLE: When the going gets rough, load guides help you launch and load no matter what the weather. Available on most models. T BUNK LOAD GUIDE – ADJUSTABLE: A convenient medium-duty load guide that is easy to install and fits most small to medium EZ Loader boat trailers. ALUMINUM WHEEL – ADJUSTABLE: Upgrade your trailer with these aluminum wheels. Available in 12 in. through 16 in. wheels. FOUR BUNK EXCHANGE – ADJUSTABLE: Replaces the regular two bunk system with a heavy-duty 3x4 four bunk pivoting system for increased support. FOUR BUNK OPTION – ADJUSTABLE: Adds two additional, fully adjustable bunks to an existing two-bunk system. CHANNEL GLIDE BUNK COVERS – ADJUSTABLE: EZ Loader copolymer bunk covers attach over carpeted bunks and let your boat slide on and off the trailer with ease. BRAKE FLUSH KIT – ADJUSTABLE: Help clean brake components with this handy flush kit. Attach a garden hose and flush! Useful in saltwater environments. INBOARD CROSSMEMBER EXCHANGE – ADJUSTABLE: Special recessed cage helps protect your boat’s inboard shaft and propeller during launching and loading. KEEL PADS AND KEEL ROLLERS – ADJUSTABLE: For extra protection. A selection of 4 in., 5 in., 8 in. and 12 in. keel rollers are available, as well as a variety of keel pad sizes. 12 INCH HEAVY DUTY DOUBLE KEEL ROLLER – ADJUSTABLE: Adjusts to your boat perfectly during launching and loading. Automatic pivoting action. Adjustable height. ROLL EXCHANGES – ADJUSTABLE: Want to update your boat trailer with the latest in patented non-marking roller technology? Ask your dealer today!